I’ll preface this review with an important point about parenting books – what works for some doesn’t work for others. I remember a well-meaning friend pressing the latest-and-greatest parenting book into my hands when my baby boy was going through a rough patch with his naps. “It will change your life”, she promised. Actually, it gathered dust on my book stack. I tried, but for whatever reason it didn’t resonate with me at that particular time. Indeed, success with parenting books is as much about timing as content – hit on the right advice at the right time and it is like gold. 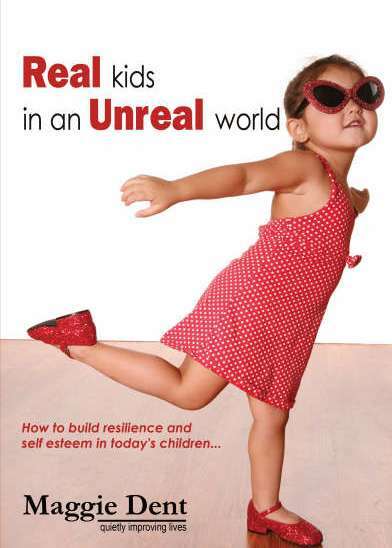 Real Kids in an Unreal World by Maggie Dent delves into the matter of building resilience and self-esteem in children. The overarching premise is that for the most part, children are exposed to lots of ‘stuff’ (consumer items, technology, media and so forth), however what is really important are healthy relationships – hard to argue with that! The book explores the ten essential building blocks that help children build resilience and self-esteem, from a healthy pregnancy and the importance of good nutrition to building life skills, involving children in a meaningful way and finishing with ‘Self Mastery’ and strengthening the spirit. If that sounds lofty, I assure you, it’s not. Within each of the descriptions about the building blocks are lots of straightforward tips for parents ranging from practical suggestions for encouraging plenty of play and tips for setting boundaries through to strategies for managing stress. I like that this book is presented in a simple, easy-to-delve-into format. The fact is, few parents have the time to sit down and read a parenting tome cover to cover. Instead, you dip into them here and there, zeroing in on the bits that are relevant at that time. This is where the format of Real Kids in an Unreal World works – sure, you can read it cover-to-cover but you can also open it to any page and grab some really useful information. So without pressing the main points of this book on you, two things that were mentioned stuck with me – firstly “There is no substitute for REAL experiences with real people, doing real things and exploring the real world” (in other words, turn the television off) and secondly “Children spell love T-I-M-E” – I’ll remind myself of that next time the kids beg for five more minutes at the park – dinner can wait. Real Kids in an Unreal World is $27.50 and is available from Maggie Dent’s online site.